A new Candyman installment will hit theaters next summer. Jordan Peele‘s Monkeypaw Productions has found its Candyman. So who’s up for the legendary role once played by the iconic Tony Todd? While the deal has yet to be inked, Variety reported today that Yahya Abdul-Mateen II is in talks for the bee-friendly titular role in the upcoming entry. Get Out mastermind Peele is producing, while Little Woods writer-director Nia DaCosta is on board to direct from a script written by Peele and Win Rosenfeld. MGM, Rosenfeld, and Peele’s Monkeypaw Productions are set to produce. Abdul-Mateen portrayed the villainous Cadillac in Netflix’s The Get Down and was most recently seen in Aquaman as Manta. The actor will seen next in Peele’s Us which hits theaters next month, and he’s also signed on to star in HBO’s Watchmen series. 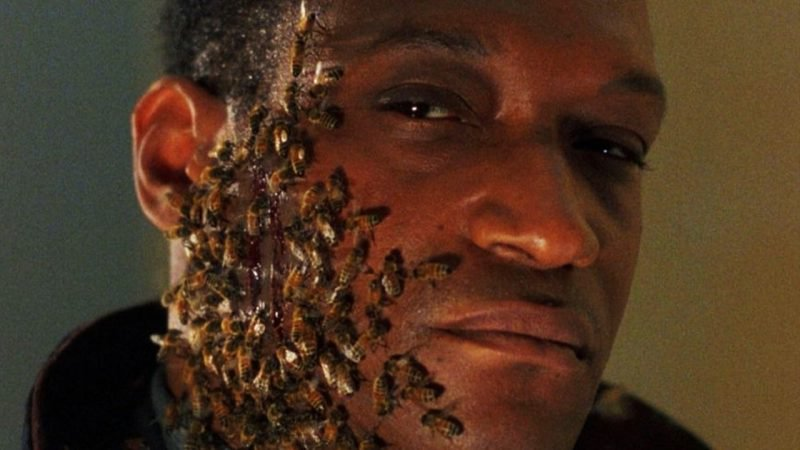 Set for release June 12, 2020, Candyman 2.0 is being sold as a “spiritual sequel” that will return to the Chicago neighborhood where the legend began, though gentrification has taken over the area where the Cabrini-Green housing projects once stood. Spiritual sequel, remake, reboot, re-imagining…the terminology is exhausting. But a new Candyman movie is an exciting proposition, especially with Peele behind the scenes. The writer-director-producer is also rebooting The Twilight Zone for CBS All Access. The original take released in 1992 and followed a graduate student who explored the legend of Candyman while writing a thesis on urban legends. Along with its star Todd, Virginia Madsen, Xander Berkeley, and Kasi Lemmons also starred. The movie was written and directed by Bernard Rose from the book The Forbidden by Clive Barker. The movie spawned two sequels, Candyman: Farewell to the Flesh and Candyman: Day of the Dead. Discover & share this Horror GIF with everyone you know. GIPHY is how you search, share, discover, and create GIFs.